We must take care while downloading any file from the internet. For better security, I always suggest downloading files from trusted download websites. Because we never know when we fall victim of an infected file. There are tons of great stuff online and we daily download so many things. So, it will be better to scan the file you are going to download and check whether it is safe. We have already covered how to protect your web browsing with WOT that warns users when they try to access a malicious website. But hackers are now more active and advanced. They always try to upload their infected files on trusted and legit websites. So we must take extra precautions while downloading something from the Internet. 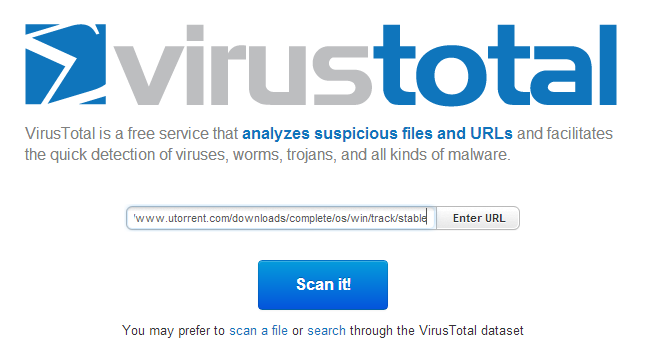 There is a nice online app, VirusTotal that allows users to scan a file or URL for all known kind of malware infection. In case you have downloaded the file, you can upload it to the VirusTotal and then scan whether it is safe or not. But it will be a nice idea if you check the file just before the downloading. To scan a download URL, copy the file link on the website. And then open the URL scanner in the Virus Total. Here put the URL and click on scan. It also remembers if the URL has been previously scanned and show you when it was last scanned and what was the result. You can either reanalyze or click on View Last Analysis to see the scan results. It scans a URL or File and matches it from more than 30 virus signature database. It also shows a detailed result if any of these virus signature databases found any infection. VirusTotal is also available as extensions for various browsers that allows users to scan a file directly from the browser without opening the VirusTotal website. You can either scan an individual file, individual URL of a full website. Although, it scans files and URLs to check whether it is infected or not. Still, you need to download the latest antivirus and keep it updated always. You should also update your operating system and other software installed in the system.